One of my favorite things about working in email is seeing all of the interesting copy email marketers are writing in attempts to create a successful email marketing campaign. It’s fun to see new approaches and it certainly challenges us here at SendGrid when writing our own. Even though most emails you receive may seem pretty simple, creating compelling email copy that effectively reaches your target audience can actually be quite a challenge. 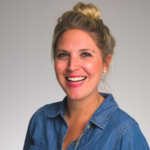 We’re frequently asked for tips and insights on how to run an effective email marketing campaign so I’d like to share some insights from me and my colleagues here on the blog. One of the most important elements of your email copy is your subject line. It’s the first thing your recipients see from you in their inbox outside of your branding and your from address. We’re often asked how long a subject line should be, so our Big Data Team did a study and found that while 7-9 words are the most commonly used in subject lines, 3 words actually see the most engagement. 1. Keep it short and sweet! This is key when it comes to your copy, especially since so many users are interacting with your email on mobile. (Over 70% in some industries, according to our Global Email Benchmark Report.) Don’t include your whole website or landing page in your email—give your recipients a reason to click! 2. Be sure to watch what buzzwords you use. SendGrid’s email engagement and email subject line analysis showed that words like “yesterday” and “tomorrow” saw better engagement than “today.” And that “soon” saw better engagement than “now.” Maybe this data is showing us that putting too much urgency in our subject lines isn’t effective? This is a great hypothesis to test in your own program. 3. Experiment with hashtags. The Big Data Team also found that hashtags saw low engagement. But, that doesn’t mean they won’t work for your program. It seems like senders are starting to write more like people text, so maybe hashtags in subject lines could be the next big thing? Try it for yourself to know for sure. 4. Consider testing all CAPS in your subject line. Senders have been wary of this tactic for a while, but all CAPS might not trigger spam filters as much as we once thought. We actually use all caps here at SendGrid (sparingly) when we want to show emphasis. The next area of focus outside of your subject line in your pre-header text. This text (that usually says “Email not displaying correctly? View it in your browser.”) is often overlooked by marketers. Take advantage of this real estate to build off of the message that you’re setting in your subject line. Here’s a great example from our customer, Fitbit. I particularly like the 3rd example here. Right on brand and welcoming. Seeing this in my inbox definitely helped encourage an open. The whole point of a successful email campaign is to convince recipients to click and ultimately convert, so your call to action is arguably the most important piece of content in your email! 1. 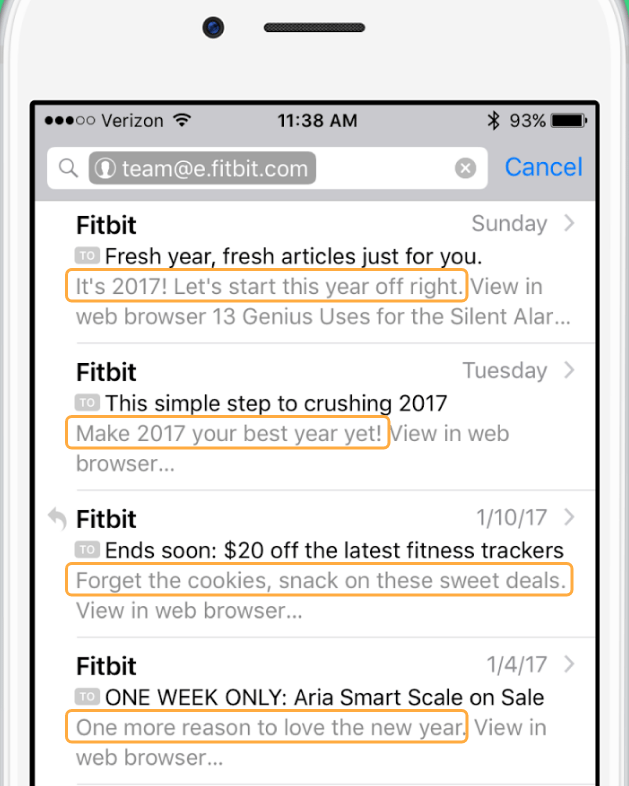 Continue the message that you’re setting in your subject line (and your pre-header text) through to your CTA. Your messaging, tone, and ask should be connected and move recipients closer towards their next click. 2. Be direct and make your CTA actionable. You don’t want to leave any uncertainty about what action you want your recipients to take. Here’s a great example from Spotify—their CTA is actionable and effective! 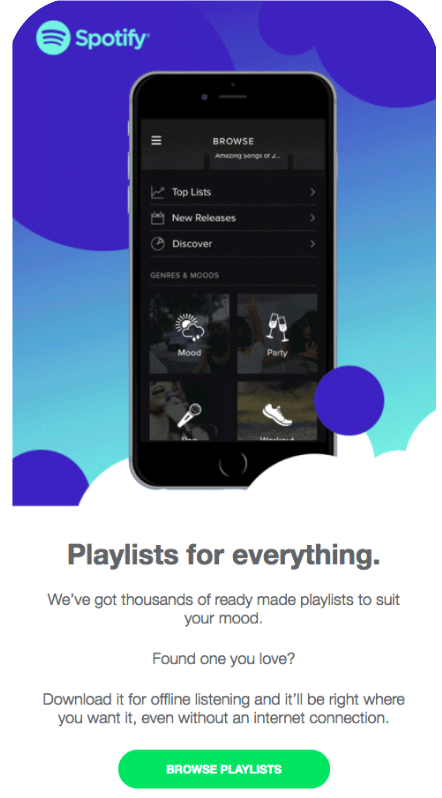 Spotify uses one clear CTA here, but how many CTAs is a good idea? 1 to 2 is spot on, unless you’re sending a newsletter. Tip: If you include too many links throughout your email, your users can get confused and not know where to click. 3. Avoid too many links that can bloat the size of your email (especially if you’re adding tracking parameters)–if this happens and your email gets over 102kb, you risk having your email “clipped” at Gmail and Yahoo. Here’s a great example of an email that gets it right from our customer, OpenTable. It starts with a great subject line, a fun, inspiring pre-header and then an actionable CTA. There’s clear branding throughout and notice the brief text. 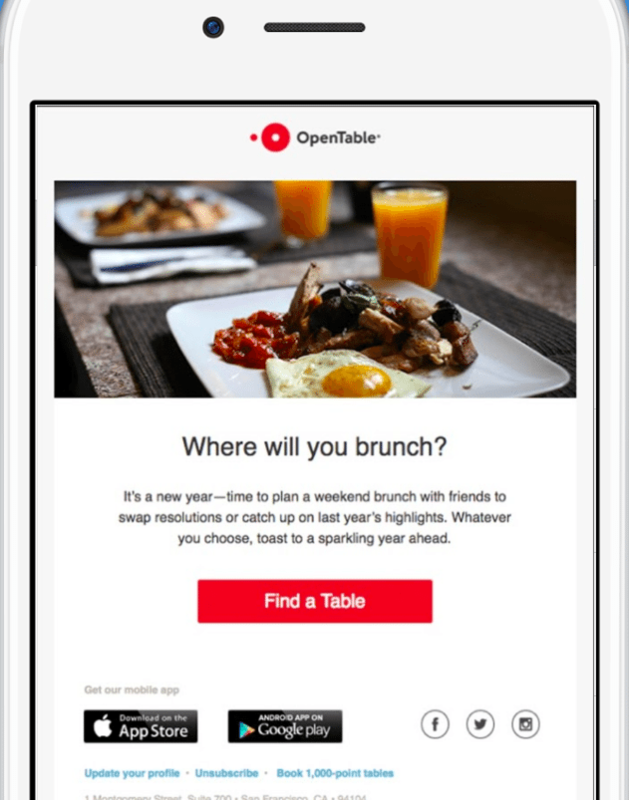 Our Delivery Team advises having 2 lines of contextual copy for every image used, so OpenTable gets that perfectly right here. I have to admit that QA is my favorite part of developing email messages. We’ve all experienced emails that don’t turn out as perfectly as we’d hoped. This is where your copy and design QA comes in. Focus on running your emails by a copyediting team (or at least another set of eyes!) and creating a checklist that you cross-reference with for each email campaign. It’s super easy to miss simple (sometimes disastrous!) mistakes, so take the time to thoroughly vet your copy before you send. Learn how email veterans deal with email mistakes by listening in on SendGrid’s Email Marketing Mistakes webcast. For design, you want to make sure that the email that you see is exactly what your recipients will see in their inbox after you send. Browser testing with tools like Email on Acid and Litmus can help make sure your emails are rendering correctly in all browsers. Finally, ensure that your messaging is consistent across all customer touch points. Many times, different teams own ads, website copy, and email programs. After you’ve worked so hard on creating the perfect email message and getting a user to click on your CTA, you don’t want to throw them off by sending them to a website or landing page with different copy/branding/offers. Keep communication and brand consistency clear across different copy stakeholders in your company to deliver the best and most consistent experience for your recipients. With your subject line, pre-header text, calls to action, and quality assurance in place, you’re well on your way to building an effective email marketing campaign. But while building out these pieces, never forget to provide value in every message you send to your recipients and make them as personalized as possible. Creating meaningful connections with your recipients is what effective email marketing is all about. Put your customer first and all of the other pieces will follow. If you’d like more tips on building your best email campaign, check out our webcast Anatomy of a Marketing Email.